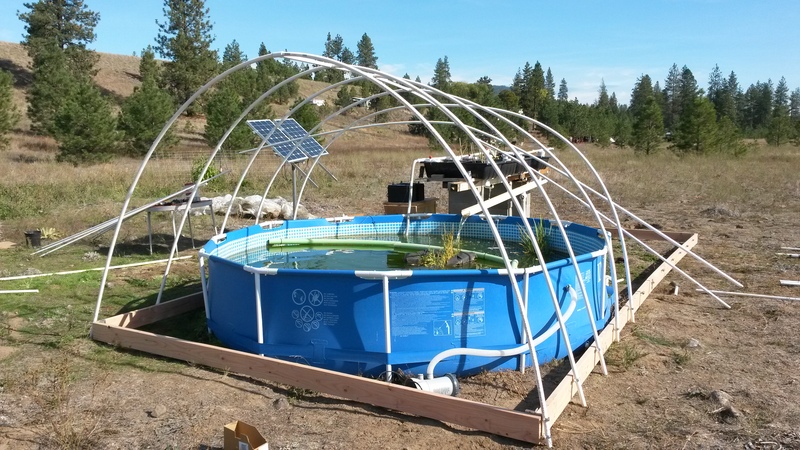 Recently, we covered the aquaponics project I started last May. The greenhouse seems to be working great, but some things are hard to get to now. Batteries are some of those inaccessible items. Time to add an upgrade to the electrical system. You can see the batteries on a small table just above the pool, in the shade of the grow trays. This pic was obviously taken while assembling the greenhouse. Our system runs off of solar. The panels run through a charge controller that manages the batteries. There are wires that run from the batteries to the pump. The pump moves water to the trays and everything is happy. Unless of course you need to do maintenance in the trays, on the batteries, etc. Every once in a while, the controller gets confused and we have to unhook the pump for an hour as well. The first version (I’ll call it Mark 1) of the electric was no frills. I was using batteries with threaded posts, and I wrapped the bare wire leads around the posts and screwed them down. I’d use channel locks to loosen and undo the wires when needed. Mark 2 was when the wife started running the AP. I was traveling and I didn’t want her to have a bad experience with the batteries. I bought some clamps and attached them to the wires. The clamps were like a small version of jumper cables and it was easy to unhook the batteries. But now, the batteries aren’t easy to access. I planned on knocking this out the last time I was home. I ran out of time/light. I bought some Radio Shack parts (I don’t recommend Radio Shack btw, but they were all I had short notice) and put together a box with a toggle switch. The wires were soldered and everything. I didn’t get the chance to splice the box into the system though. So, of course I drove away. Had to get back to work. I threw my wife to the wolves basically. I emailed her a very crude drawing of what needed to be done. It works! I also am giving extra points for proper use of a bungee cord, although I understand she may screw the box to the frame later. Two notes about this pic: you can see one of the clamps on the battery and you can also see the knife that used to be mine. I’d like to find the DC equivalent of a breaker box where I could have a place to hook up lots of items to the juice. I’ve seen them in Europe, but not here. Once again, the wife has come through. Some day she’s going to figure out that she can do anything she puts her hand to. 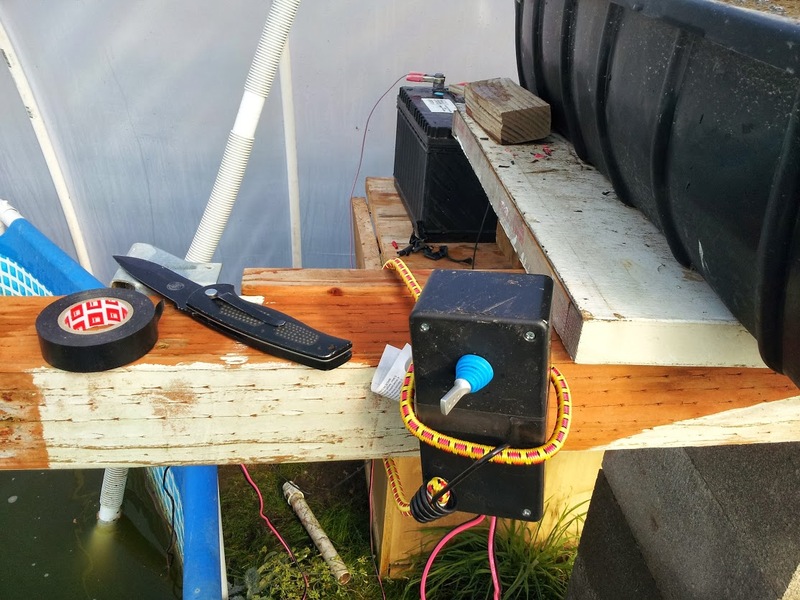 This entry was posted in Buildings/Structures and tagged aquaponics, DC, electrical, toggle by admin. Bookmark the permalink. Aww shucks! you make me blush! I couldn’t have done it without your ‘crude’ drawing/notes. I have yet to tackle installing that new light switch…scared to burn the house down. Im always amazed at you two. Great team work. version 3 is coming this May and I am psyched!